Want to know where to camp near the Murray River? 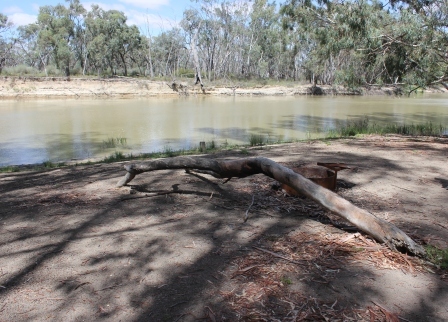 Then visit here - the Murray River National Park. It comprises Katarapko, Lyrup Flats and Bulyong Island . This area covers around 13,000 hectares. We visited the Katarapko area with features of floodplains and several wetlands. It is about 180km northeast of Adelaide (just outside of Berri) and takes about 2.5hrs - 3 hours from Adelaide. Access was via the Sturt Highway, and just follow the signs to Berri. Turn off at Winkie Road and follow to the end. The Katarapko section is well sign posted on Katarapko Crescent. If you miss the turn off, you can access the Park via Lower Winkie Road (which also will lead to the Eckerts Creek section of this park). Another campground not too far from here is Loch Luna - definitely worth considering as a place to visit, close to Adelaide. Katarapko is a National Park - so NO generators, no dogs and no collection of wood allowed. In the area we were visiting – Katarapko Section of the park, there are 40 campsites, all on the Katarapko Creek. When you read “creek” I imagined a small waterway. This creek was more like a small river, so that was our first surprise! The campgrounds are well sign posted, especially campsites 1-17. We drove in and looked at many of them, and this is the best way to work out what is right for YOU. Your campsite choice will be dependent upon what you would like to do in the park. Most campsites are VERY well spread out. Depending on the time you camp, you might not have anyone near by! For our camping, we wanted very easy river access (ie. no steep banks), privacy, shade and if possible, a sandy little beach to access the water. We had a kayak, so ease of entering and exiting the water was important for us and our children. We explored many of the sites, most of which lead off an unsealed road in the park, and these campsites are not readily visible from this road. So you would drive down to the campsite of your choice, and find that someone was already had their camp set up – you cannot see campsites from the main road through the park, which is great. Campsites we did see, especially in 1-17, were all of a good size and their suitability for caravans and trailers differs at each site, so you will need to possibly view a few before you find one that suits your vehicles(s). Large gum trees surround all sites, and evidence of those gums that did not survive drought or storms abound – lots of large branches and trunks all over the place. Just a reminder about camping underneath these gums – don’t do it. Some of these trees are huge with massive limbs. Sites 1-17 had some steep banks which made us using our kayak a little more tricky, so we found the sites from 18 onwards, better suited to our needs. In saying this, the signage for individual campsites did not seem as good here, though the park remains one of the best for signage we have come across. Campsites will be closed (gates in place) should there be wet weather or flooding. You would need to check with rangers to see if your campsite of choice is affected should you decide to go after heavy rains or Murray flooding. The campsite we chose was PERFECT for us, and met all our needs. It was very close to another campsite, but you would have not known that there was another campsite next door, as it was unrecognisable as one – overgrown, rocky ground, no access to creek, small. The only people we saw during this camping time were fellow kayakers paddling down the creek. So the lesson here is to look around as much as you can before you choose as there are a huge range of campsites on offer. Before the booking system came into existence, the following was a big issue at Katarapko. Now that you have pre-booked your site, the likelihood of the following occurring will have diminished, but we have left the following information in as a matter of interest, and a reminder about other campsites around Australia where there are no booking systems operational. On long weekends, this seems to have become a very popular place (it never used to be this busy, but in 2013 and onwards, it seems to have become more so) and you will need to get there early to secure a campsite. Arriving in the late afternoon of a long weekend, you might find yourself without a spot. Don't try to "share" another campsite - everyone is up there to get away from it all, and I think some common courtesy is to let those who arrived first, the opportunity to camp in peace, alone. If you see a space is occupied, turn your vehicle around and keep looking,. From what we could tell and what we saw – 1 toilet for campsites 1-17, and another toilet for campsites 18-40. They were the only 2 we came across. These are pit toilets and were well maintained, as most places in this park seemed to be but like all pit toilets, the busier the location, the smellier it can be! So we cannot say they are going to be bearable on every trip, and pit toilets can deteriorate rapidly in terms of cleanliness and smell. Campers would be highly recommended to bring your own chemical toilet. Most occupied campsites that we saw, had one. Some people obviously use the bushes and trees, and when we have visited recently, evidence of toilet paper was around in abundance. Dispose of thoughtfully. This park has so much bird life, the leave no trace principle must apply. Additionally, bring all your own drinking water, or be prepared to sterilise the water from Katarapko Creek. There are no garbage disposal locations, and no dogs are allowed. Fishing – we caught in very rapid succession, the scourge of the Murray River – carp. And more carp. This fish is horrible and very abundant. It is illegal to return carp to the river once you have caught one. Catch and dispose – but do not transport live! They were jumping in the river, and it was so easy to catch them....just using bread as bait. At one stage, we were catching around 1 per minute. We did our “bit” for helping the Murray River. Apart from fishing, we caught (and released) yabbies and freshwater shrimp. This is a wonderful area to get out your kayak. The current was mild and very manageable when we were there, and lots of little waterways to explore. There does appear to be quite a considerable amount of submerged branches/trees in the creek, so caution is still required. From your kayak/canoe you get to see some of the beauty of this area, including all the birds which call this area home. Largest variety of birds I have seen anywhere, including the Coorong. This is a great way to explore this park, and highly recommended activity. The view from the water gives you a different perspective of the park. We also swam in the creek, and in parts it was so shallow we could all stand up – but then it dropped away very quickly to deep water. Those freshwater shrimp like to nibble on your feet if you stand still in the water long enough! They operate out of Berri and regularly supply hire kayaks and canoes to people camping at Katarapko and Loch Luna (also do guided kayak/canoe tours around the same areas). They can also give people updated information about current conditions, e.g. if any sites are closed, how wet the tracks are, how strong the flow is, what sites might suit them best (you can otherwise spend a lot of time driving in and out of campsites which we can attest to). This is a beautiful spot in South Australia, and visiting it in autumn was a perfect time of the year. No mozzies to bother us, and flies were manageable. Summer could be very uncomfortable with flies and mosquitoes, so not sure if I would do so. But any other season, I think this park would have something to offer everyone. My children loved it – when they weren’t playing by the water, they had lots of fallen logs and bush land to play in and create imaginary games. I think a guide to how much you enjoy a campsite is, when you are packing up, you regret leaving...This was the case for us. We wanted to stay longer; such was the tranquility of the area. Since our first visit, we have returned many times to this location, and other parts of the park. If you would like to hear about another favourite spot on the River, please read our review of Loch Luna. Or if you are travelling around Renmark, camping at Chowilla Game Reserve is also an option.